The governorship race in Imo State has taken a new dimension in the State with Social Democratic Party, SDP governorship candidate, Okey Ezeh taking on the the All Progressive Grand Alliance, APGA guber candidate, Senator Ifeanyi Araraume. According to a statement by signed Collins Opuruozor, Chief Press Secretary to Ezeh, he said it is “worrisome beyond words, perplexing beyond imagination that Chief Araraume for the fourth time as a Governor daydreamer in Imo State has not managed to come with even a paragraph of Manifesto, however badly written. 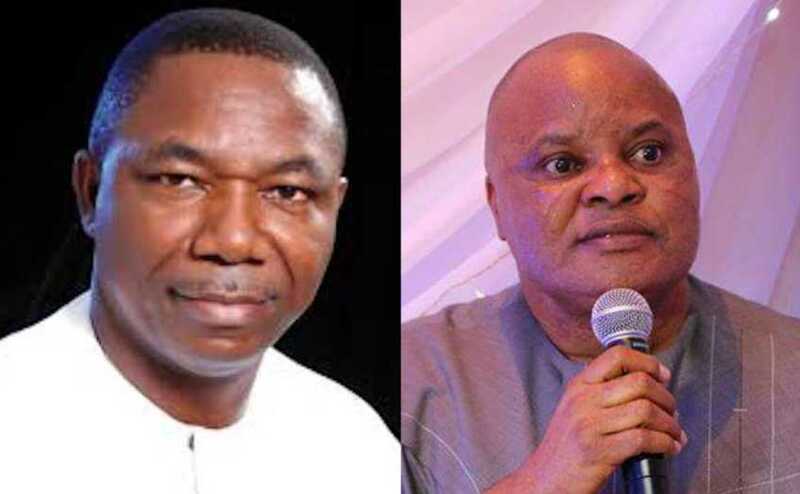 “It is worrisome beyond words, perplexing beyond imagination that Chief Ifeanyi Araraume for the fourth time as a governorship daydreamer in Imo State has not managed to come up with even a paragraph of manifesto, however badly written. It is further disturbing that, just this time, all that the Isiebu-born career politician has said he wants to achieve is to recover Imo from Chief Rochas Okorocha. “What is even more shocking is not really that the man thinks memories have faded away and that Imo people have forgotten how he personally handed the State over to Chief Okorocha in 2015 for a mess of porridge, but that he feels he is in any way better than Chief Okorocha. Whatever tendencies that have defiled Chief Okorocha are also abundantly found in Araraume. The difference between the duo is just in their colors, unless perhaps there is also any difference between six and half a dozen. “And because this election is about a paradigmatic departure from career politicians who can offer nothing but can loot everything, who see state power as means of production, who build personal islands of affluence in a sea of collective affliction, and whose moral compass answers to the grammar of greed, Chief Araraume, of course the culprit-in-chief in all these, has no place in the consideration of Imo people. This is what he has to realize. “The above is an eloquent testimony that Chief Araraume knows just nothing about the economy of Imo State. This explains why he has not come up with any economic blueprint for almost two decades that he has in all vehemence and fury unsuccessfully angled for the coveted office. “The fact is that Imo is not currently a viable entity. This verdict is premised on the ratio of Imo’s internally generated revenues (IGR) to her allocations from the Federation Account Allocation Committee (FAAC). In 2018, the State’s receipts from FAAC stood at N85 billion as against her IGR of N6.8 billion, showing a ratio of 8.1 percent of IGR to FAAC allocations. Another indicator which reveals more vividly the sorry state of the entity called Imo is the ratio of total expenditure to IGR. Every month, Imo generates internally an average of N450 million but spends an average of N4.6 billion. The difference shows you the extent of our bankruptcy, of our unviability and of our ruination. “Again, when you look at the breakdown of the expenditure profile of Imo State, about N2bn is personnel cost, and between N2.5bn and N2.8bn covers monthly overheads. When you look at that, it’s frightening. “The first surgical operation that Sir Okey Ezeh intends to carry out will be to attack the overheads. Over-bloated overheads can be curtailed in 30 days. Flying private jets, 1st class tickets, luxury guesthouses, lengthy convoys, too many idle appointees and inflated projects can be shoved aside in days and our books balanced in 90 days. When the bleeding taking place through over-bloated overheads and unverified personnel costs is stopped, there will be enhanced revenues, and proper accounting of Imo’s true IGR figures will yield nothing less than N1.2bn monthly. “Sir Okey Ezeh is a financial management pundit and Imo is in dire need of his technocratic intervention to midwife the rebirth yearned for. Chief Araraume and his hirelings should confine themselves to their forest of demons where gnashing of teeth abound in perpetuity for the oppressors of the people. For Douglas House this time, it is about competence and credibility, and #OkeyIsOkay.